Do you run a travel agent business? - Are you an independent travel consultant? - Are you building an online travel business? – Do you write travel reviews, travel blogs and generally promote travel on a website? If yes to any of the above you may wish to consider developing a commission-lead partnership with Ffestiniog Travel and earn a slice of the growing rail travel tourism market. As one of the UK’s oldest and leading rail tour operators, with over 40 years’ experience, we have earned a reputation as foremost specialists in arranging rail travel and rail holidays around the world. As a travel agent/consultant you can now book any Ffestiniog Travel escorted rail tour on behalf of your clients at the click of a button and receive commission in return (rates outlined below) using our agents website. To set up an online trade link with Ffestiniog Travel simply contact Ffestiniog Travel to obtain your unique login and password. Browse through our escorted tours listing page to view all our escorted tour destinations at a glance. Each tour webpage provides a full itinerary, details of hotel accommodation and price. To make a booking simply click on the Book Now button and be ready to sign in using your unique agent ID and password. The online agent's booking form is easy to navigate and we recommend that you have your client's passport and personal details to hand when filling in the form. Use the Manage Bookings button, located in the main menu at the top right of every page to update customer details, print additional invoices or make payments. Why Work with Ffestiniog Travel? As members of AITO and ABTOT, holding an ATOL licence we offer quality, expertise, peace of mind and financial protection. Established in 1974 we are one of the oldest rail tour operators in the UK and one of the first to run an escorted rail tour overseas. We have a dedicated and expert team of tour leaders and travel consultants who have been with us for many years. We are the only Rail Tour Operator in the UK to also run a dedicated ticket only service offering advice and issuing tickets for rail travel throughout the UK, Europe and worldwide. This department is manned by experts and they are an integral part of arranging bespoke Tailor-made Tours for those who wish to travel independently. If you have a client or a group of customers who wish to travel by train to any destination in the world we have the expertise to arrange the route, make rail and hotel reservations AND get the best price. Our rail ticket department operates its own website www.myrailtrip.co.uk which details selected routes, fares and rail passes for travel in the UK, Europe and worldwide. We have the in-house expertise, supply marketing material and provide a direct and friendly advisory service to all referred clients. If you are still unsure about our credentials please inspect our website, order our annual brochure or give us a call and discuss opportunities direct. By arranging holidays for your clients from our ‘Rail Holidays of the World’ Brochure. We pay 10% commission on all Escorted tours taken from the brochure, (including any add-on arrangements). On Unescorted tours and Tailor-made tour itineraries – 5%. Since many of our customers are “direct sell”, our “Rail Holidays of the World” brochure is written in such a way that your customers may send their booking forms direct to us. Indeed, you may feel that some of the rather specialised questions should be directed at our own staff. It is therefore very important that you put your agency stamp on each booking form so that we can recognise it as originating from you. We will then ensure that you receive the appropriate commission as if you handled the whole transaction. Simply give us a call and we will supply you with a special referral code unique to your business. Do you specialise in group travel? - Ffestiniog Travel can handle and arrange all travel arrangements, accommodation and sightseeing arrangements on your behalf. Ideal for sole, independent agents. Do you act as travel advisors to special interest groups who arrange special interest tours or educational field trips? – Ffestiniog Travel can arrange all travel arrangements and accommodation. Commission rates on these services are determined by the size of the group travelling. 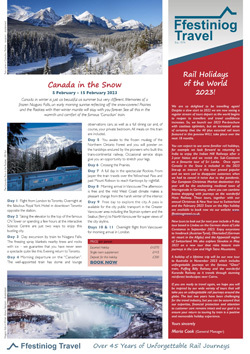 We would actively encourage you to get to know us better and are happy to supply a number of our current ‘Rail Holidays of the World’ Brochures to you for you to try-out on your clients so please do not hesitate to contact us or send us your contact details and we will include you on our mailing list to receive regular emailshots and future brochures.